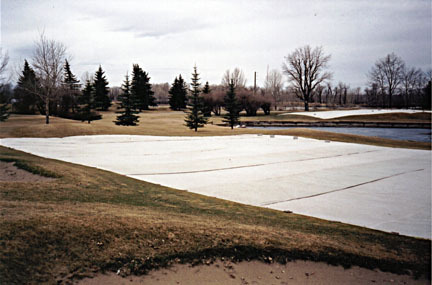 Turf Covers protect golf greens from freezing temperatures and help prevent desiccation. TurfPro covers protect turf from frost and freezing temperatures along with minimizing plant desiccation from strong winds. Our covers help to stabilize soil temperature fluctuations, thereby maintaining turf hardiness levels and enhancing early spring germination by preventing premature plant crown moisture level increases. Our TurfPro 3 insulated cover has been tested and proven to provide exceptional insulation value to maintain superior plant hardiness levels of the protected turf. In addition, our TurfPro 1 and TurfPro 2 single-ply covers have been utilized on many golf greens.